Muskogee Gun Club members are reminded of the fact that safety is of utmost importance and will be vigorously emphasized in all our shooting activities. Muskogee Gun Club is a Member organization. As such, the Club’s Range belongs to its Members. This document serves one purpose: to make sure that all Members enjoy a safe and pleasant experience while at the Range. All Members are required to know the four basic safety rules. As soon as you start thinking of the Range as belonging to You, the more the Range conditions will improve. The Range does belong to You. That’s not the Range’s cinder block that someone’s taking pot shots at, it’s your cinder block. That’s not the Range’s 2x4s getting destroyed by shooting pop bottle off the top of the backboard framework, it’s your 2x4s. Take Pride in Your Range! Never Point A Gun At Something You’re Not Prepared To Destroy! Know your target and what is beyond; make sure the downrange area is unoccupied. Wear appropriate ear and eye protection – required at all events. ANYONE MAY CALL A “CEASE FIRE” FOR ANY SAFETY REASON. Upon a “CEASE FIRE” command, shooters will immediately discontinue firing. Repeat the “cease fire” command. All actions open. Everyone on the Range must be behind the firing line before firearms are handled, actions are closed, and firing begins. All targets must be placed at a height that ensures the bullet strikes the backstop. All firing must be directed at a target in front of your firing position. No cross-firing. Firearms of unknown sight adjustment should be test fired at a distance no greater than 25 yards from the backstop. When sighting has been verified to be accurate at 25 yards, the shooter may then move the target back to the desired distance. Vehicles are not allowed on the Range. Vehicles are only allowed for Range maintenance, a scheduled event that requires their use, or as designated by club officers. While a gun is uncased, actions must remain open and magazines removed except when on the firing line, ready to fire, always keeping the muzzle pointed DOWNRANGE. Shooters shall not go downrange to targets until all shooters have cleared their firearms. Each shooter on the line must indicate that his/her firearm is clear and the action is open. Suitable targets must be used. NO GLASS, CONCRETE, OR EXPLODING TARGETS ARE ALLOWED. The club’s target frames should be used with targets placed on backboards, which are secured to target frames. Place targets so that bullets will not strike the frame but will impact the berm. No tracer or incendiary ammunition may be fired on any Range. 50 BMG, armor piercing, and full automatic weapons/ammunition are not allowed on the Range. Never place targets on top of berms. No Center fire Rifles or Center fire Rifle Ammunition are allowed on the Pistol Range! ALL USED TARGETS SHOULD BE REMOVED AT END OF FIRE AND PLACED IN TRASH CONTAINER. Shooting may begin at 8:00 a.m. Shooting must end at sunset. Always lock the gate behind you after entering/leaving the Range. You are required to wear your Membership badge at all times while on the Range. Consumption of alcoholic beverages and/or other foreign or controlled substances by Members or guests before or while using the Range is STRICTLY PROHIBITED and may result in expulsion from the Club. 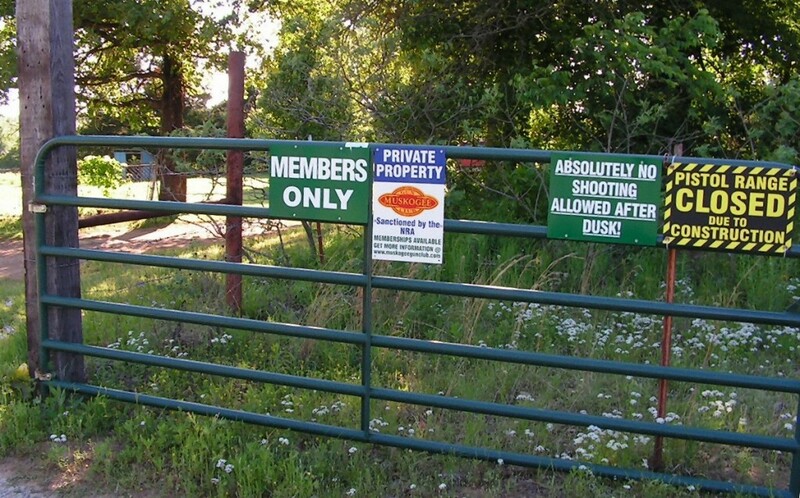 Hunting on Muskogee Gun Club property is prohibited. Conduct of a guest is the Member’s responsibility. LEOs (Law Enforcement Officers) with free membership may Not bring guests. All Federal, State and Local regulations regarding Concealed Carry are applicable at Muskogee Gun Club. Follow all Muskogee Gun Club rules. If unsure, contact an MGC Officer. A FIRST AID KIT IS LOCATED JUST INSIDE THE RESTROOM, ON THE DIVIDING WALL. Local emergency phone numbers are listed on the front of the restroom. Select the appropriate responder. Location: from Warner; drive 3 miles west of the Connors State College sign, turn right (north), go approximately 1.1 miles to road between two power poles with 5 red stripes on them, then north again for ½ mile to main gate. From Checotah: 6 miles due east to Shady Grove Road, north 2 miles to 1st stop, east 2 ½ miles to red striped poles, then north to gate. Do Not hang up! Tell operator if you have to leave the phone. If alone, give operator gate combination to facilitate emergency responder access. If not alone, try to send someone to open the gate to meet the responders. If the situation requires an emergency call, you must immediately notify the Chief Range Officer and/or an Executive Staff Member. Take notes. It’s the only safe way to accurately recall the facts. Oklahoma recognizes the Good Samaritan Law, but please do not attempt anything beyond your training/capability. Use common sense and don’t panic.